Glimpses of blue sky are becoming a rare sight in Delhi, India’s capital, particularly in wintertime, when a thick white haze smothers the city. David Hagan, an MIT PhD candidate studying atmospheric chemistry and a Fellow in the MIT Tata Center for Technology and Design, says that the city’s air quality is now quantifiably among the worst in the world. Meanwhile, a lack of specific data has frustrated scientists and governments hoping to understand the complex environments of megacities in India and China, where air quality is inextricably linked to energy systems. Emissions in megacities like Delhi can be traced to a wide variety of sources, including automobiles, fossil fuel-driven power plants, and open burning of biomass for warmth and cooking, each producing different kinds of particles. Hagan and his advisor, Associate Professor Jesse Kroll of civil and environmental engineering, saw this complexity as motivation to design a compact, low-cost air quality sensor that they hope will be deployed in dense networks across cities like Delhi, logging accurate, real-time data on the chemistry of the air. The production of PM2.5 (particulate matter less than 2.5 microns across) is a particular area of concern for epidemiologists. These fine particulates are largely generated by fuel combustion, and when they’re inhaled, they can have dire health effects, including asthma, lung disease, and heart attack. In fact, a recent study by the Chittaranjan National Cancer Institute estimated that half of Delhi’s schoolchildren have suffered irreversible lung damage. Air quality monitoring is often discussed as an either-or situation. In reality it’s a continuum, with a tradeoff between cost, size, and power on one hand, and accuracy, precision, and sensitivity on the other. We’re somewhere in the middle of the continuum. Kroll and Hagan already have several prototypes on the ground in India, reporting data to a remote server every 30 seconds. Two units are located at Nehru Place in south Delhi, and four are near Connaught Place in central Delhi, co-located with a regulatory-grade sensor for calibration. Two are in the city of Pune, near Mumbai, and one is mobile—Hagan can frequently be seen taking it on rickshaw rides around Delhi. A regulatory-grade sensor, of which there are roughly 20 in Delhi, costs between $50,000 and $100,000. Kroll and Hagan’s sensor costs “on the order of $1,000” per unit, says Hagan, and offers comparable performance, measuring six types of gases (O3, NO, NO2, SO2, CO, and volatile organic compounds) and 16 size groups, or “bins,” of particles, ranging from coarse to fine. The lower cost makes it feasible for these sensors to be deployed in large volumes, creating an opportunity to map pollutant distribution at greater levels of detail. There are several low-cost and do-it-yourself devices on the market already, but the sensitivity of Hagan’s design, including its ability to measure particles as small as 380 nanometers across, sets it apart. 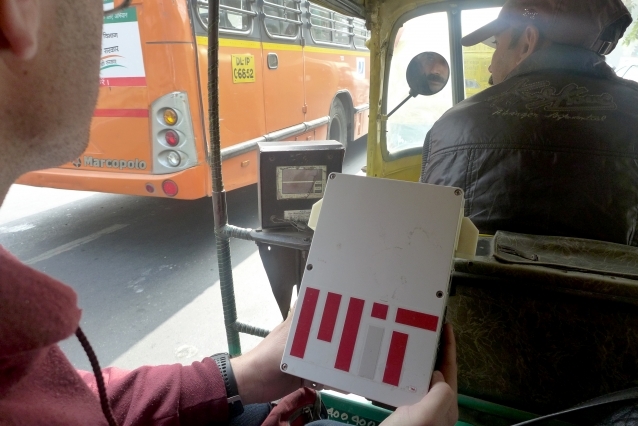 PhD candidate David Hagan frequently takes his sensor on rides around Delhi in one of the ubiquitous auto-rickshaws that fill the Indian capital’s streets. Rickshaw drivers and passengers are exposed to some of the highest levels of air pollution in the world. Photo: Shriya Parekh. 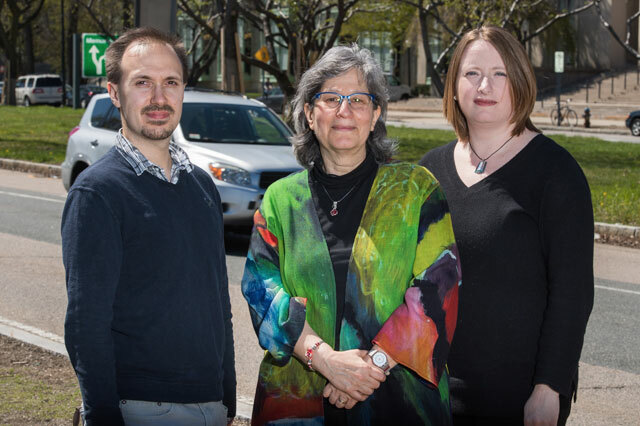 Part of the learning process for Kroll and Hagan has been understanding how the sensors will respond to a diverse set of environmental circumstances. They, along with other MIT researchers, have subjected different generations of sensors to the seasonal extremes of the Boston area, where two small grids are up and running—one on the MIT campus and the other in Dorchester— and to the highly variable conditions around the Hawaiian volcano Kilauea. I’m very interested in both the atmospheric chemistry and the user experience, which is why my sensor is different. There hasn’t been a low-cost sensor made with a good mix of quality components and a well-engineered interface. Now, with a refined prototype, they’re beginning to see how the intense heat and dirty air of Delhi will affect the sensor’s performance. One of the Nehru Place sensors became so clogged with black grime that air could no longer pass through, and, ironically, it began to record low pollutant numbers. Transparency is vital to the success of the project, Hagan says. “It’s important to be honest about what the sensor is measuring and what its limitations are.” He adds, “The next generation will be much better,” citing a robust filtration system to prevent clogging and a smaller, more energy-efficient design. Hardware is just one part of the equation. Hagan also wrote the algorithms that interpret the sensors’ raw data. He envisions a number of different possible applications for the data in both the public and private sectors. Governments and academic researchers could use it to identify emissions sources and create mitigation strategies, while factories and office buildings could integrate the sensors into their HVAC systems for indoor air quality monitoring. Entrepreneurs might purchase access and use the data in commercial products, such as in-home monitoring systems or smartphone apps that show people real-time information on the air they’re breathing. For millions of Delhi residents who live with the effects of air pollution every day, solutions can’t come soon enough. This research was supported by the MIT Tata Center for Technology and Design. More details can be found at tatacenter.mit.edu/portfolio/air-pollution-sensors. Read about an MIT analysis of PM2.5 formation and regulatory strategies for controlling it.